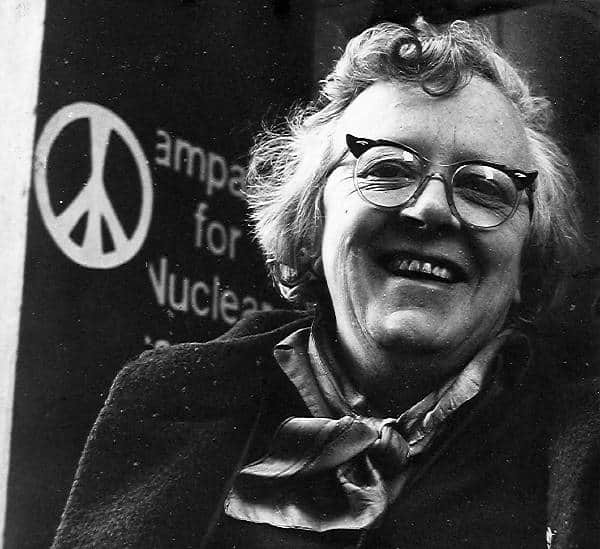 Peggy Duff was CND’s first general secretary, described by Noam Chomsky as ‘one of the people who really changed modern history’. Having worked as a journalist after her university years, she began peace campaigning in the late 1930s and worked for a number of progressive causes both before and after her involvement in founding and running CND. Peggy organised the Aldermaston marches from 1959 to 1963: when she wrote her autobiography in 1971 she dedicated it most of all to ‘the Aldermaston Marchers, whom I loved’. Peggy was a human dynamo, sometimes chaotic, according to CND’s first Chair, Canon Collins, but tireless and energetic achieving impressive results.